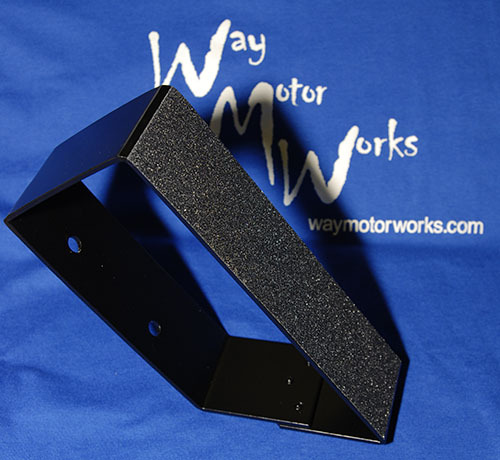 The WMW Dead Pedal replaces your existing factory dead pedal in order to raise the pedal height. Why would you want to raise the height of the pedal? With raised pedal your left foot can reach the clutch faster. Added benefit is your left knee will be bent at the same angle as your right while driving down the road. With the long drives between Indianapolis and Atlanta I have found the new knee position to be much more comfortable. Also I have found on the twisty roads I can brace myself better during hard corners. 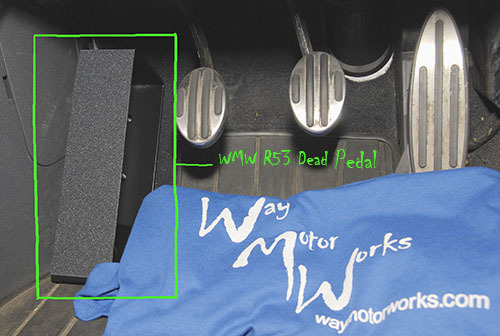 This new pedal fits all models between 2002 and 2006 (R50 and R53). I have had this installed for 4-5 months and after getting used to it find that I really like it. It keeps your left foot at the correct level to ease it onto the clutch pedal and it is the correct height to serve as a proper brace while driving in a spirited fashion. Thank you WMW. I pretty much mangled the OE dead pedal during removal but I'm not going back after installing this instead. Dead pedal puts your foot beside the clutch pedal -- its perfect! You'l need to modify the OE floor mat for it to fit or the mat will lay just on top of the bottom of this pedal.